"The mutilators haven't made one misstep. are taken. They're obviously playing with us like a cat plays with a mouse. And it's driving folks, including the authorities, right up the wall." 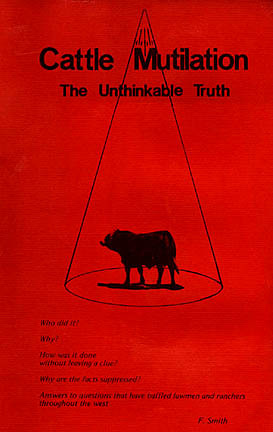 Fredrick W. Smith asked on his 1976 book cover, "Who did it? Why? How was it done without leaving a clue? Why are the facts suppressed? (This book has) Answers to questions that have baffled lawmen and ranchers throughout the west." Fredrick William Smith was born in Salmon, Idaho on October 21, 1920, and raised in Butte, Montana where his father was a miner until his death when Fred was 8 years old. Then his mother moved the family to Denver.On May 5, 1945, Fred Smith married Grace Elizabeth Deaton. The couple had seven children, four boys and three girls. Fred worked as a goat farmer, part-time plumber and wrote. By the mid-1970s, he was puzzled by unusual cattle deaths in Colorado. Fred talked with law enforcement and ranchers in eastern Colorado and came to the conclusion that whatever was killing the animals, and bloodlessly excising tissue in similar patterns from animal to animal, was not human. In 1976, he published his investigation, not knowing that at the same time Deputy Keith Wolverton in the Cascade County Sheriff's Office in Great Falls, Montana, was collaborating with writer Roberta Donovan to summarize the sheriff's reports about mutilations in that region. Fred Smith died in Delta, Colorado near Cedaredge on July 24, 1997 at age 77. See Mystery Stalks The Prairie. Who - or what - kills and mutilates animals around the world - and why? Fredrick Smith's 1976 book, self-published in a limited quantity, has long been out of print. But now with his family's permission, Earthfiles.com presents an electronic version of the original work.